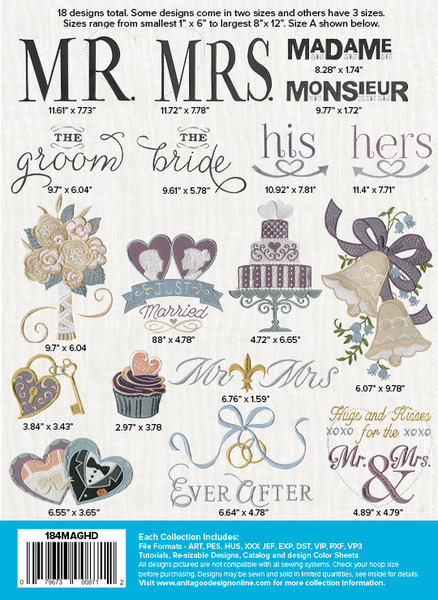 Mr. and Mrs. is the perfect embroidery collection to give your wedding or your friends’ and family members’ weddings that extra, personal touch. The designs in this collection are perfect for personalizing everything for that cherished day. Or give you the tools necessary to make a really special and meaningful gift from the heart. This mini collection has 18 total designs; all ready to be paired with your creativity to become beloved keepsakes and memories for any wedding day. These designs can be embroidered on towels, bathrobes, throw pillows, potholders, trivets, and so much more to create that perfect, handcrafted gift made with one thing money can’t buy: love.